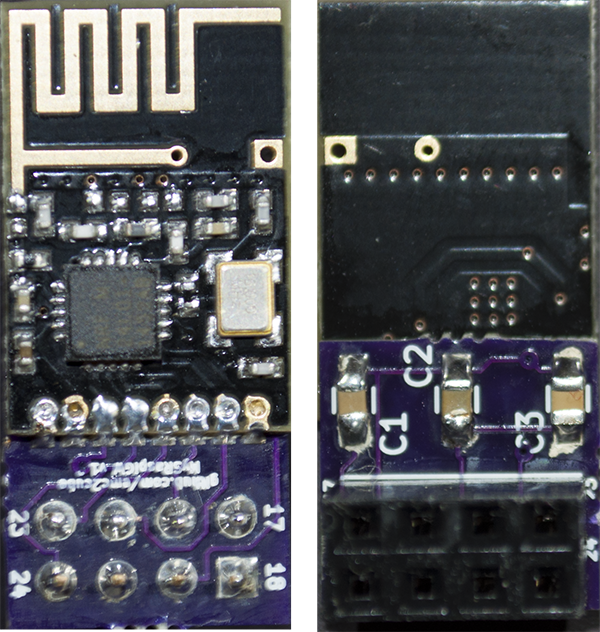 MySensors SMD gateway (nRF24L01, 2.4GHz) designed to fit Raspberry Pi GPIO ports. Shrunk SMD version of GertSanders Raspberry Pi2 GPIO interface for NRF24L01+. Two different models are available, only difference being the PCB shape. Regular version is the smallest form factor available. Radio module is straight with GPIO pins. A Pimoroni version is also available, designed to fit inside the popular Pimoroni cases designed for the original Raspberry Pi model B, such as Pibow. PCBs.io 4 for $0.89, black 1.6mm PCB, ENIG finish. OSHPark.com 3 for $1.10, purple 1.6mm PCB, ENIG finish. Plug the Gateway module to Raspberry Pi Pins 17 to 24 and follow the instructions on MySensors website to compile the code. Version 1.1: IRQ pin support.